In this gripping narrative history, Lesley Hazleton tells the tragic story at the heart of the ongoing rivalry between the Sunni and Shia branches of Islam, a rift that dominates the news now more than ever. Even as Muhammad lay dying, the battle over who would take control of the new Islamic nation had begun, beginning a succession crisis marked by power grabs, assassination, political intrigue, and passionate faith. Soon Islam was embroiled in civil war, pitting its founder's controversial wife Aisha against his son-in-law Ali, and shattering Muhammad’s ideal of unity. Combining meticulous research with compelling storytelling, After the Prophet explores the volatile intersection of religion and politics, psychology and culture, and history and current events. 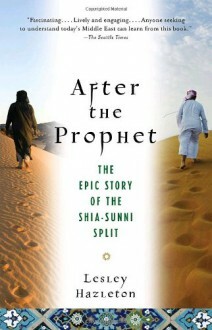 It is an indispensable guide to the depth and power of the Shia–Sunni split.